Everything about the Cleveland Browns' move to Baltimore in 1996 was, well, awkward. The new franchise had to rush to prepare for a season, which included a stretch with no logo or team colors on jerseys as players practiced. "I REALLY remember our first game against the Raiders," Alexander said on Glenn Clark Radio April 3. "We came out and we win that game and we felt just so much love in the city. After that game, we kinda knew we were in a great place to play football. The fans accepted us, and they were excited and we were excited to be there. It was just a great place to play for a couple of years." Alexander had plenty of special moments during his two seasons in Charm City. 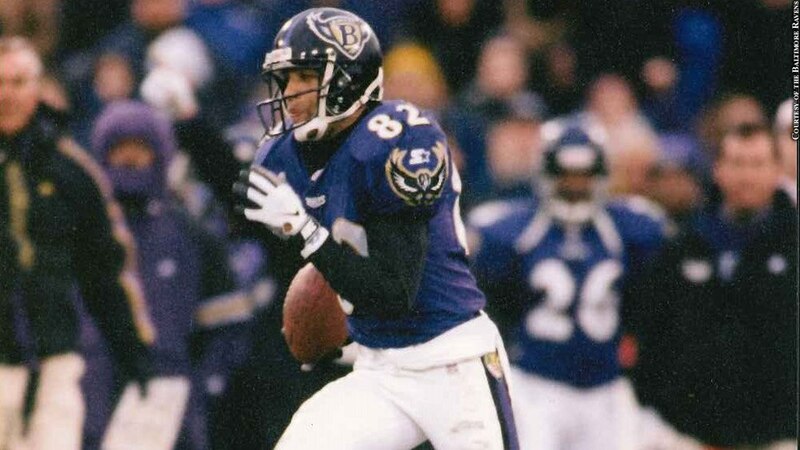 He posted back-to-back 1,000-yard receiving seasons, hauled in the first receiving touchdown in team history and caught the go-ahead score in the first "big win" in franchise history, the Ravens' December 1996 victory against the Pittsburgh Steelers at Memorial Stadium. He even met his wife, Kim, late during that inaugural campaign. And after more than a decade away from Baltimore, Alexander has now returned. He's joining his former Michigan teammate Tyrone Wheatley's staff as wide receivers coach at Morgan State. "This is pretty incredible to come back," Alexander said. "I've got a lot of ties still in Baltimore. My wife's from Baltimore, her whole family graduated from Morgan. This is pretty ironic. So our whole family is excited, her family is excited, everybody there is really excited to be able to come back to Morgan games and watch some football." None of this was really ever part of Alexander's plan. "Even when I was playing I never thought I would want to coach," Alexander said. "I always thought those guys spent way too many hours doing what they do and trying to get us ready. I didn't think I wanted to spend so much time over there just doing football. Near the end of my career, the playing, the injuries and all of those things, all you want to do is ... when you're done with football you just want to relax. "So when I was done with football and I tried to relax, but all I wanted to do is get back on the football field." Alexander tried other things. He started an entirely new career in IT, but he just couldn't stomach being stuck behind a desk. So after a decade away from the game, he took a job on the staff at Division III Wilmington College in Ohio in 2015. That led him back to Kansas City, where he had spent four quality years with the Chiefs after departing Baltimore, and a gig at NAIA level Avila University. While Alexander was grinding at low levels, Wheatley was working his way through the ranks with assistant coaching jobs at schools like Syracuse and their alma mater, Michigan, as well as with NFL teams like the Buffalo Bills and Jacksonville Jaguars. "We've been in touch over the years," Alexander said. "He had mentioned to me that he had wanted to get a head coaching job, and I was like, ‘Man, if you ever get one of those head coaching jobs, I'd love to work with you!' The opportunity came up and he called me and I'm like, ‘Well, we've been talking about it for awhile so I'm all for it.'" For those of us in Baltimore of a certain age that we're just slightly too young to have vivid memories of the Baltimore Colts but are just old enough to have experienced the misery of a childhood without NFL football, players like Alexander are particularly significant. That high-octane offense of the 1996 Ravens was a lot of fun, even if the team didn't win many games. When we think of going to our first NFL game or attending our first tailgate or gathering with friends and family for the first time ever to watch "our" team on a Sunday, we connect those memories with guys like Alexander. That's why it's so genuinely great to have him back. Of course, it also can't hurt Morgan to have such a genuinely accomplished player with name recognition locally helping to recruit kids. And it wouldn't hurt if maybe he could call in a favor and ask for a certain rookie from that 1996 team to come over to talk to the Bears. "At some point I'm trying to hook up with Ray [Lewis] and see if we can get him over there," Alexander said. "He's very inspirational. Even when that guy was a rookie, you could tell he was going to be a leader!" Can you picture Hines Ward in purple and black? What about Aaron Rodgers? Glenn Clark takes a look at what might have been with 15 Ravens draft do-overs, revisiting some of the team's less successful first- and second-round picks in past NFL Drafts.